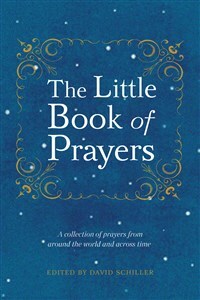 The perfect gift for seekers, the curious, and the spiritually hungry, The Little Book of Prayers now has a stunning new cover and a more prayer book–like format. Gathered from holy books and prayer books, from songs and spirituals, spoken traditions and poets, it is an unexpectedly approachable collection of common and uncommon prayers from around the world. The entries, one per page or spread, are chosen for their depth of feeling, beauty of expression, spiritual intensity, and sense of the universal. The book is organized into broad categories of praise, entreaty, contemplation, mourning, and grace; and two indexes—one by authorship, and the other by topic—make it immediately accessible. There are familiar prayers, like the Lord’s Prayer and 23rd Psalm, which, placed in new context, shine with a renewed beauty and wisdom. You’ll find prayers unfamiliar to many in the West, such as the “Opener” from the Koran or the four vows of the Boddhisattva, chanted every evening in Zen monasteries around the world. And the surprising—from the “Prayer of the Unknown Confederate Soldier” to the blues of Lightnin’ Hopkins to the poetry of Rumi. colors, so it will be beautiful.